Today India is famous for the vibrant Bollywood superstars but it wasn’t always like that. Before mass media India was a fairly traditional colony with some western influences. People had to attend concerts in order to hear musicians perform. All of this changed with the invention of the gramophone. It was during this era when singer-dancer Gauhar Jaan an ethnic Armenian from Calcutta became a superstar whose music was heard around the world. She is credited with India’s first ever recording on a gramophone, recorded on 2 November 1902. Gauhar Jaan was already a revered name in India’s musical circles in the late 19th and early 20th century. Known as “the first diva” among Baiji courtesans, her experimental approach to music and her adaptability had made her a force. And when India entered the gramophone era, it was no surprise that she was the first person to embrace the technology. Thus, when Frederick William Gaisberg, the Gramophone Company’s first India agent came to India he chose Gauhar Jaan as the first artist whom he wanted to record. India’s first disc had Gauhar Jaan, singing a khayal in Raag Jogiya, recorded on 2 November 1902, by Gaisberg, an assistant to Emile Berliner, the father of Gramophone record. A musical gathering without Gauhar Jaan is like a bride without a wedding. Born an Armenian Christian and baptized as Eileen Angelina Yeoward, she established herself along with her mother as a leading vocalist of Calcutta. Her artist name Gauhar suggests that her mother who also changed her original name might have converted to Islam. She devised the wondrous formula of compressing usually very lengthy Hindustani music to the 3 minute capsule, which is all that a single-side of a record could hold. She ended all her recordings with the loud and somewhat flirtatious announcement ‘My name is Gauhar Jaan!’. In those days, there were no facilities in India to cut the master disk (acetate). So the master tape of the recording was sent to The Gramophone Company’s pressing plan in Hanover (Germany). The announcement of the name at the end of the song helped the technician identify the singer. Gauhar Jaan sings the evergreen Dadra ‘Aan Baan Jiya Mein Laagi’ set in Raag Gara and in Hindustani language. Feisty and hedonistic, she threw lavish parties and drove around Calcutta in horse driven buggies for which she even paid a hefty fine to the British Government as commoners were not allowed to ride horse buggies. Gauhar’s photographs appeared on picture post-cards of the time and also on match-boxes made in Austria. In her illustrious career she cut close to 600 records in over 15 languages that included Hindustani, Bengali, Urdu, Arabic, Sanskrit, Katchi and even English and French. Later in life, she sought refuge in the Mysore court under the patronage of Maharaja Krishnaraja Wodeyar IV and died there as a state guest in January 1930. In 1903, Gauhar Jaan’s records started appearing in Indian markets and were in great demand. She became very famous; so much so that when King George visited India for the Delhi Durbar, Gauhar Jaan was invited to Delhi to sing for him. She sang a special song congratulating the emperor on his coronation She was accompanied by Allahabad’s famous courtesan, Janaki Bai. Today her story is largely forgotten, but several attempts are being made to revive her music and life-story bringing it to the larger audiences in India. In July 2013, the executive director at the Indira Gandhi National Centre of Arts, Vikram Sampath launched the website, Archive of Indian Music (AIM), a comprehensive online repository for digitization and preservation of old and rare Indian gramophone records. Now, Sampath has joined hands with the Google Cultural Institute and curated the first online exhibition of 10 pioneering Indian women of the gramophone era. Gauhar Jaan was born on 26 June 1873 as Eileen Angelina Yeoward, an Armenian Christian in Azamgarh in present-day Uttar Pradesh. By sheer coincidence I happened to meet someone whose ancestors were pastors in the Holy Trinity Church in Allahabad, where she was baptized in 1875. Fortunately, the church registers were maintained from the 1850s onward, and so I found my first documentary proof of Gauhar Jaan – an account of her baptism, with the names of her parents and grandparents and other witnesses to the ceremony. In 2016 a theatrical play Guahar was performed in India receiving much praise from the public. One of India’s major Bollywood stars Amir Khan and filmmaker Kiran Rao have also showen interest in creating a major feature film based on her life. Yeoward – family name, Armenian? Sounds very British to me. Lee. I guess they have changed it at some point. But Gauhar Jaan was apparently very aware of this confusion. 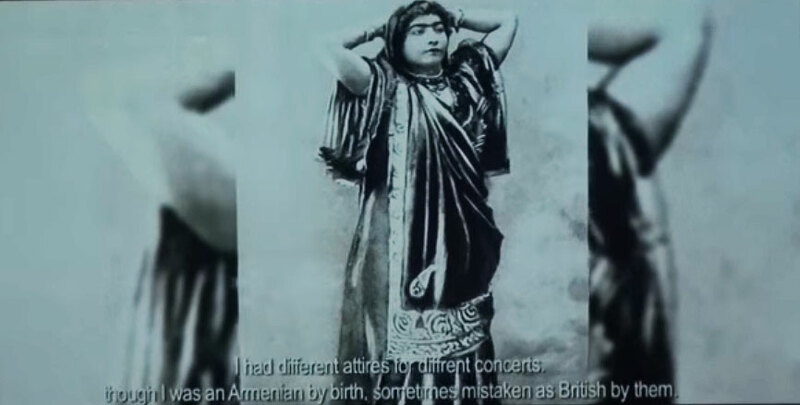 In one of the documentary features about her life, they have quoted her saying “I had different attires for different concerts, though I was an Armenian by birth, sometimes mistaken as British by them.” See: It reminds me of the famous Indian comedian with a very British name Russell Peters. By the way, The name Gohar is very common among Armenian women. Not sure why the writer would suggest her name suggested the mother had become Muslim. Highly unlikely.